After several years struggling to make much of itself, Dover got a break when the Ohio Erie Canal passed by on the Tuscarawas River in the mid 1820’s. Dover happened to be the only tolling station on the canal in Tuscarawas County. Like many communities in northwest Ohio, the canal provided opportunity for growth and by 1840, Dover’s population had grown to 600. Dover was a milling center with several flour mills processing local farm crops into easily shipped packets on the canal. With the increase in population, Dover got its first post office, but to avoid confusing over Dovers Ohio, Dover was designated as Canal Dover, much like many other communities along the canal (i.e. Canal Fulton and Canal Winchester). This designation was later changed and today the city remains just Dover. Despite its industrial base, Dover remained heavily influenced by the nearby agricultural communities, particularly the Amish and Mennonite communities in Sugarcreek and the along countryside extending out to Amish dominated Holmes County. Today, however, agriculture plays a much less prominent role in Dover than in years past. Home to the Dorver industrialist, Jeremiah E. Reeves, the 17-room, Victorian home, topped by a third floor ballroom, has been carefully restored by the Dover Historical Society to its original turn-of -the-century splendor and features the unique treasures of the original furniture and antiques owned by Mr. and Mrs. Jeremiah E. Reeves. Everything has been arranged as they would have been 100 years ago. The beautiful family furnishings can be viewed up close, as there are no ropes or barriers prohibiting entrance into the rooms. 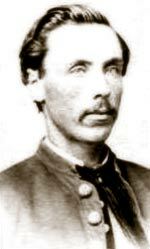 Quantrill was born in 1837 in Dover to Thomas Henry and Caroline Cornelia (Clarke) Quantrill. He was the oldest of 8 children, 4 of those children dying in infancy. William’s father was a tin smith in Dover and involved in local scandals that included theft and fraud. It is reported that William's father often beat him but his mother doted on him. Quantrill was killed at the close of the Civil War, but his head was just recently buried in Dover. Read the real story about the infamous Quantrill.